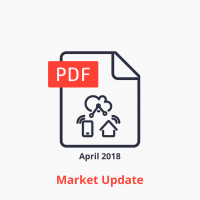 121-page industry market report examining the global Industrial & IoT Blockchain Market. + Technology breakdown of Industrial & IoT Blockchain Market solutions. + Scenario-based market sizing breakdown by region. + Business models implemented for Industrial & IoT Blockchain Market solutions. + 10 Detailed vendor profiles. + List of 38 real-world Industrial & IoT Blockchain deployments. + 6 Trends and 6 current challenges in adoption of Industrial & IoT Blockchain solutions. + 40+ Charts analyzing the market. + Market Data tables in Excel. + Competitive Landscape and 10 detailed vendor profiles. 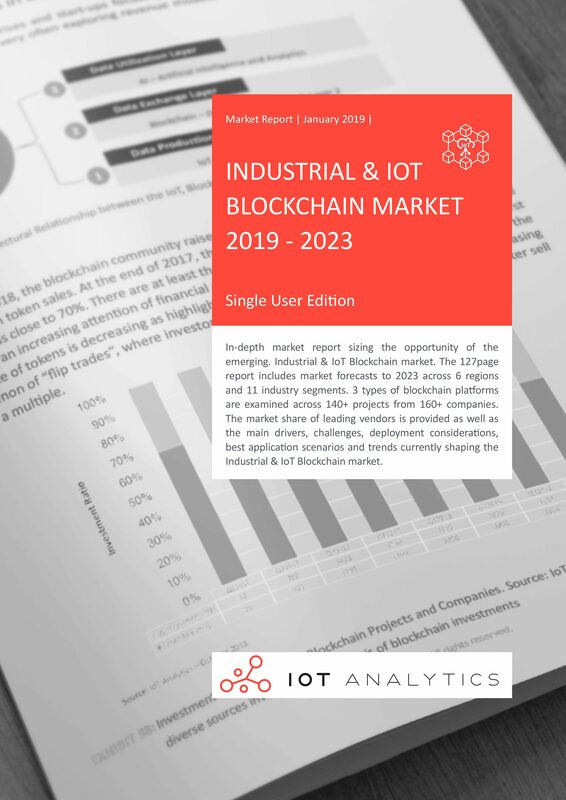 The Industrial & IoT Blockchain Market Report 2019-2023 report is part of a larger effort of mapping global emerging topics such as blockchain, drones and others. As the Internet of Things (IoT) continues to transform businesses, economies and society, new technologies are increasingly being combined with IoT to explore the potential benefits. In recent years, Blockchain technology has been hyped as the next revolutionary technology to enhance the IoT, especially in terms of security, privacy and trust mechanisms. In this report, the distributed ledger technology is examined in detail to better understand the capabilities of the nascent technology and assess its application in real IoT settings across different industries. Furthermore, with 140 Industrial & IoT blockchain providers competing, it is becoming more and more challenging for companies to evaluate the market and select the best vendor for their business. Leveraging an accurate understanding of the complex Industrial & IoT Blockchain Market will enable companies strategically position themselves to take advantage of the potential in combining blockchain and IoT solutions. The Industrial & IoT Blockchain Market is examined in detail for the period from 2018 to 2023. Worldwide market sizing is provided for 2018, and a five-year growth forecast for the market is presented for 2019–2023. For this study, market sizing is based on 3 main assumptions: 1. Companies exclusively focused on banking, finance, and insurance have been excluded in this analysis. 2. Only a small portion of companies are currently realizing revenues with their blockchain solutions. 3. During the period 2018-2020, the blockchain-IoT community remains mainly concentrated on pilot projects. 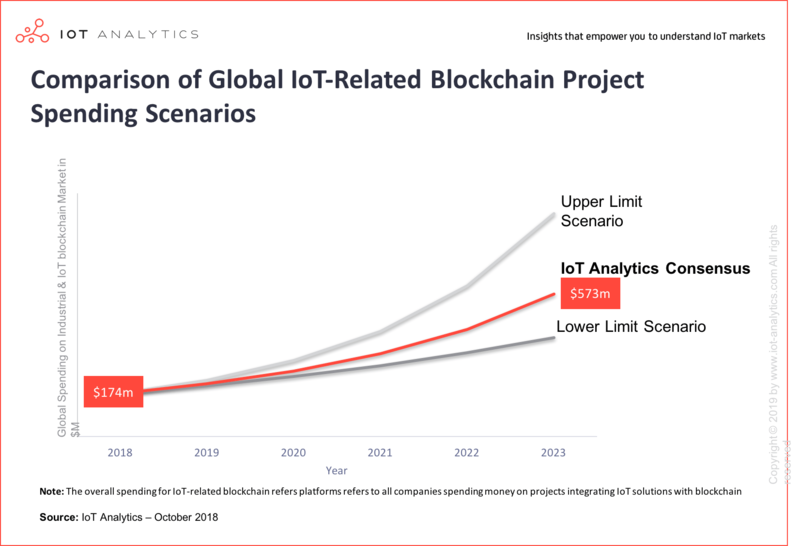 IoT Analytics expects spending in the global Industrial & IoT Blockchain Market to grow at a CAGR of 27% from $174M today to become $573M opportunity by 2023 – driven by encouraging pilot project results and ongoing corporate investments. The comprehensive Industrial & IoT Blockchain Market report, the first in a series of Emerging Topics reports, examines worldwide deployment and spending, with segmentation analysis by region. Additionally it further examines the market landscape of 140 players, including a market share analysis of the biggest Industrial & IoT Blockchain players globally and regionally. Definition used for the Industrial & IoT Blockchain Market report: Industrial & IoT blockchain refers to all contexts and environments in which there is a sensor landscape that gathers data with the goal to perform some actions. 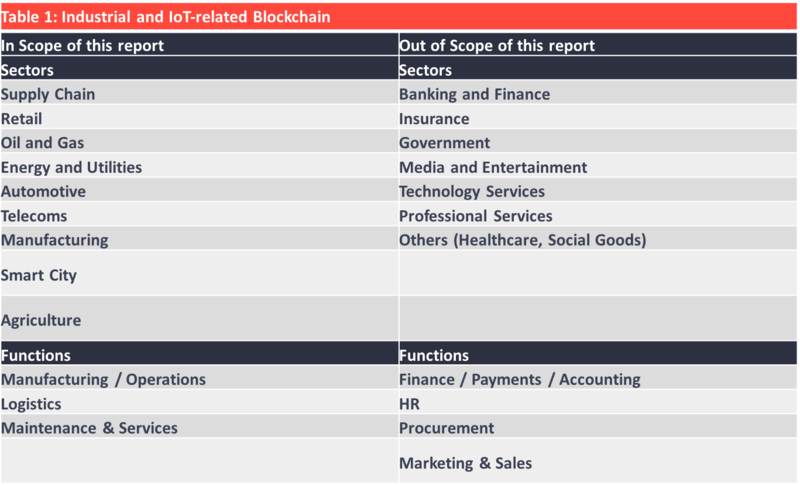 For the purpose of this report, it will be called Industrial & IoT-related blockchain sectors. Table 1 shows what is included and what is not included in that category. Read the corresponding press release here. The terms and conditions of the different license plans can be found HERE.